A Cumbrian scene that means home to them. 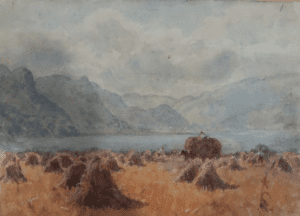 This is inspired by the work of David A Baxter of Borrowdale, an official war artist who settled in Borrowdale after the war and painted landscape watercolours of our area. Entries should be at the Museum by 5pm on 8th January 2019. Entries should be on paper no larger than A3. The Competition is open to all school aged children. All entries should have the name of the pupil, key stage, age and name of school (or contact details for home school groups) written on the back of the entry. The competition will be judged by the Friends of Keswick Museum. A winner will be selected from Key Stage 1, Key Stage 2 and Key Stage 3/4. The winners will receive an art box and have their picture exhibited alongside Baxter’s work within the gallery. All paintings entered will be scanned and played on a screen within the exhibition.